I have come to the conclusion that garden design is more challenging than interior design. I could be happy with a garden environment like Jacqui Getty's and have been working on it ever since I saw this shot above in C Magazine. But for some reason, mine is missing something. The "must have" garden elements I have grown to love, clipped evergreen plants like privet, boxwood, bay, olive, and azalea, are all here. Symmetry and scale are here as well. ... I always feel inclined to do more, plant more, change it about. Is a garden ever done, really? All images taken in my garden, except C Magazine's image of Jacqui Getty. I put together these interior design color boards for my specialty services, Design in a Box and Room Service. Room Service is my one day home makeover. It provides dramatic improvements, both visual and functional, to one's home. 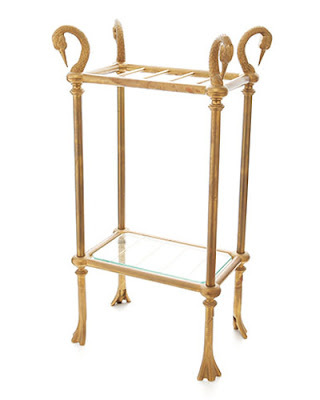 It was created for collectors of art and fine antiques; households with a lot of furniture and accessories; and for newlywed couples combining the disparate elements of their two households for the first time. Room Service results are extremely beneficial for the client because we are working with the things they already love and arranging them in the most striking manner. 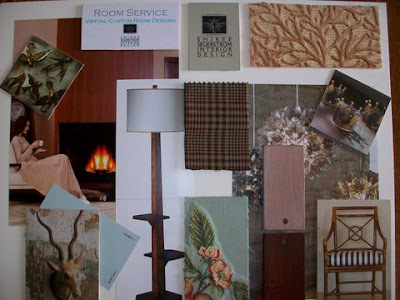 The best home makeovers come from the ability to understand each client's needs and from a strong visual sense of what is beautiful without looking contrived. 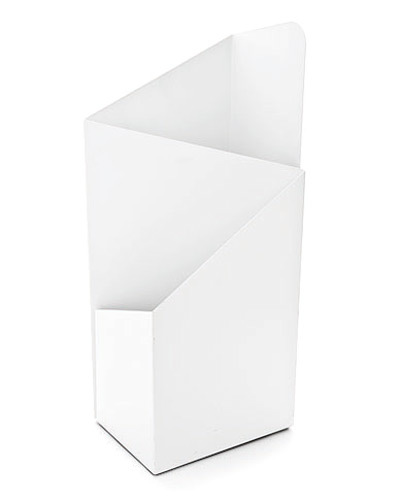 Design in a Box is my comprehensive, mail order design service that provides floor plans, fabric swatches, and a list of accessories. Clients take a fun, written test called Home Work to determine their special needs, lifestyle, and their own unique sense of style. Design in a Box was created for people who are just starting the life long endeavor of feathering their nest. It gets you a firm foundation of floor plans and a list of furnishings to build upon over a period of one year, five years, and beyond. It is a wonderful guide for helping you develop your own, personal style. Click on my name Shiree Segerstrom for more information. I look forward to Thanksgiving each year like a child looks forward to Christmas. 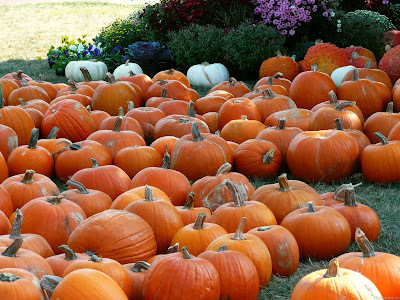 There is something about the fall colors, crisp weather, and the hordes of people the holiday brings into one's life. It is less commercial than Christmas and certainly more relaxed. This year, being a dad for the first time, my brother Robert will be doing the turkey. We will celebrate at my house with Mom, David, Christian, Miyuki, and new baby Colter. 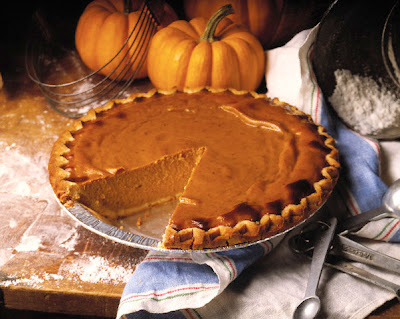 Pies are kind of a specialty of mine so pies and salad will be my contribution, and the table and centerpiece. I'm thinking about doing an arugula, beets, and orange salad, with a little grated, good quality Parmesan cheese and champagne vinaigrette. 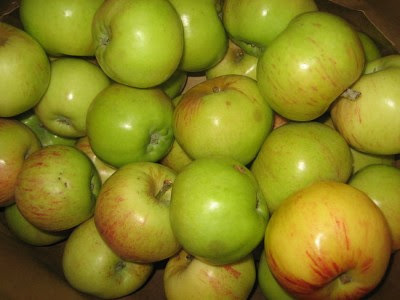 Since David doesn't like pumpkin pie, I will also make one with apple. It's no hardship to me to have one of each. 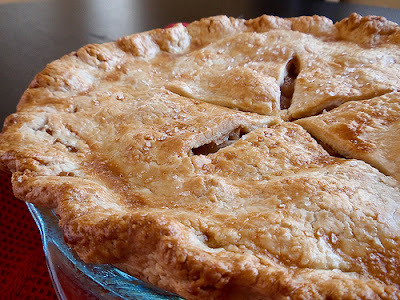 You can find my apple pie and crust recipes in the archives. I have never made a pumpkin pie filling from whole pumpkins. Instead, I have taken the easy route and used canned pumpkin puree. The Silver Palate cookbook, my foodie Bible for 25 years, has a particularly good recipe. 2- Beat eggs and both sugars together in a mixing bowl till light and fluffy. Stir in pumpkin, spices, and salt and mix thoroughly. Stir in cream and half and half. 3- Roll out pastry on lightly floured work surface and line pan with it: trim and crimp the edges and pour in filling. 4- Bake pie for 8 minutes then reduce heat to 325 and bake until filling is set. A knife inserted in the center will come out clean, another 40 to 45 minutes. 5- Arrange the pecans decoratively around the edge, pressing them lightly into the warm filling. Arrange five pecans in a flower pattern in the center of the pie. Cool completely before cutting. UMBRELLAS TAKE A STAND, plus some amazing retail sites to explore! I adore accessories in all forms. 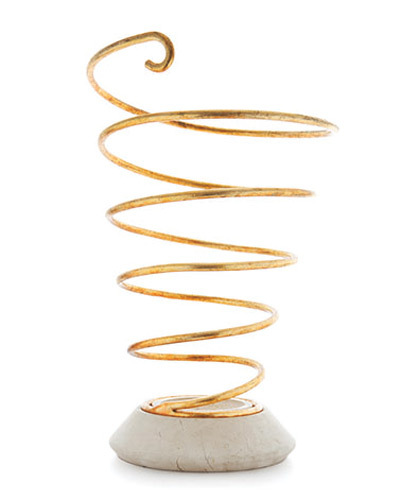 Lamps, candlesticks, potted plants, framed photos, candles, bookends, and books to some extent although they may not typically be classified as an accessory. I love having beautiful things around me. What is even better is when beauty meets function. The umbrella stand falls into the latter category. They have a purpose in life and apparently it's not enough just to hold umbrellas. They want to look pretty too. Lexington Gardens Chinoiserie umbrella stand. 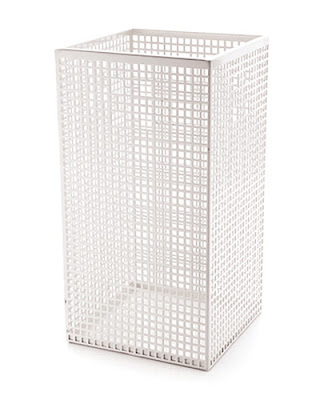 These stands, featured in this months Elle Decor Magazine , have definite opinions. The stand above is a statement maker in red, perfect for traditional or classic interiors. 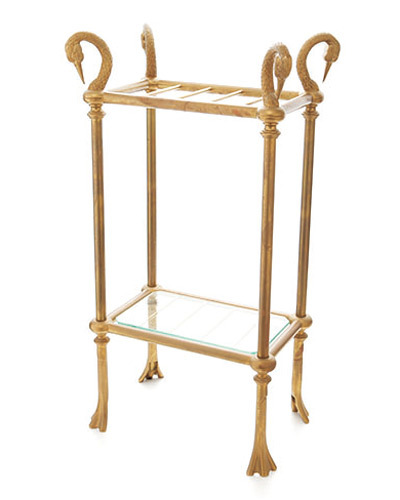 The gold one, from Mecox Gardens, is for formal interiors but would make a nice statement in a sophisticated, contemporary setting as well. 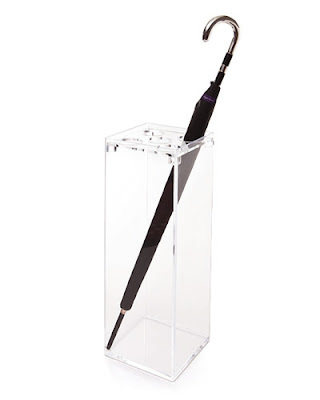 Clean and simple, the Plexi-Craft Plexiglas stand above goes well with most interior styles. Beware that bugs and dust will inevitably collect in the bottom. I would add polished stones. 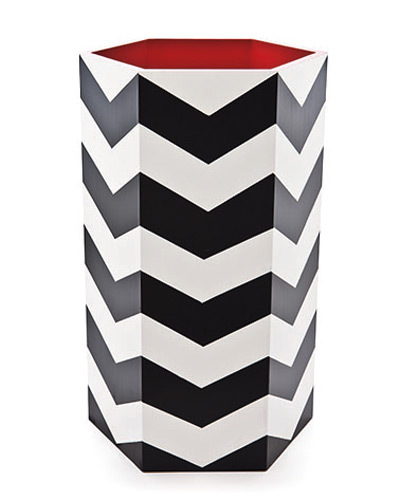 An ultra-cheery touch to any winter foyer. I hereby declare red as the new black. 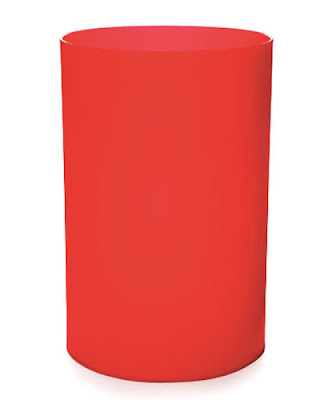 Kartell umbrella stand above. 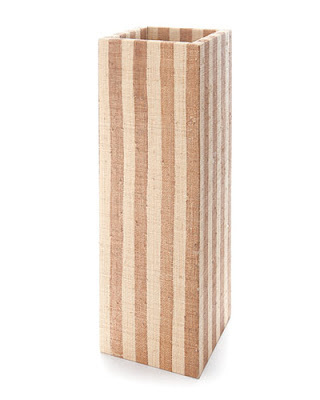 This stand from New York's Neue Galerie seems a perfect umbrella stand for the office. 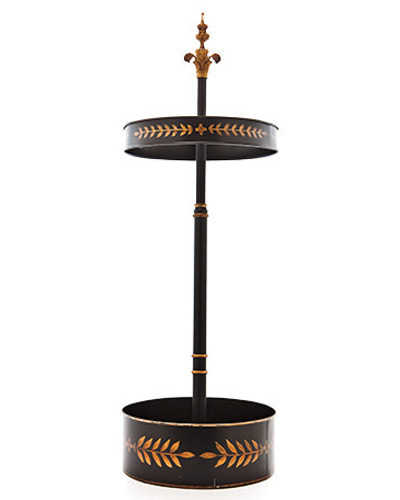 This is a whimsical yet sophisticated version of the umbrella stand, from Bunny Williams' Beeline Home collection. A very modern stand, a kind of affordable art. ABC Carpet and Home. Aero Studios by Thomas O'Brien, Thomas' designs are tailored, clean and decidedly masculine. The stand above reminds me of those great latticed rooms of the early 70's, the ones that had white lattice on the walls, and bright Kelley green furnishings. Ankasa. 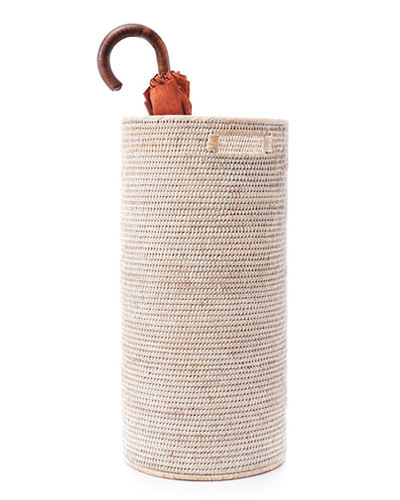 Suitable for interiors with Boho or natural themes. It would also be smashing with Moorish styles. Robyn Brooks. Shop Lam umbrella stand. Don't you love the contrasting red interior? 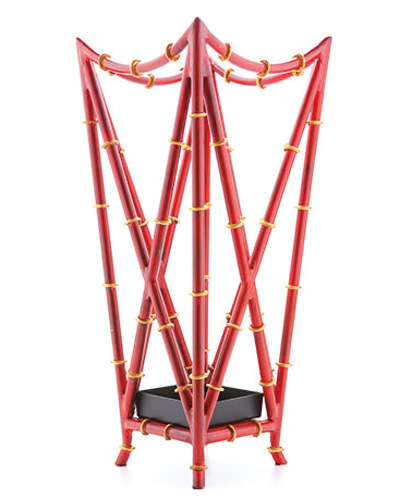 This stand makes a strong statement and would look good in modern rooms. I believe the painted style above is considered Tole, which has roots in Germany and Scandinavia. The overall style would look good in traditional or classic interiors. 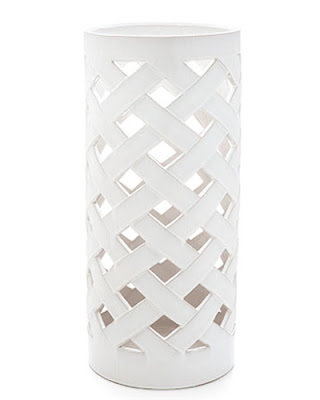 When you have finished reading about the umbrella stands, take a moment to back over all the wonderful websites. 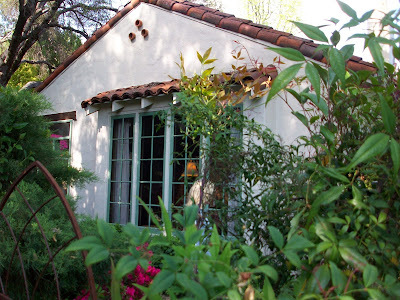 ALMOST READY FOR WINTER...an old, 1930's Spanish Revival is getting some TLC. What a year this has been. The last three winters have made it necessary to do some major repairs on my old home. We have restored portions of the roof, replaced gutters, painted and restored all the windows and most of the doors, painted much of the interior, trimmed the trees, restored structural beams, refinished the kitchen's original wood floors, replaced the kitchen appliances, and this weekend, put away all the exposed outdoor furniture and stored the window screens. Louise, my irrigation person cleaned out the "little fountain" and will come back next week to replace the burned up pump motor in the large fountain, the one I had installed in honor of Jim. Louise is a powerhouse. I know that whatever problem my timers, irrigation systems, and fountains give me, she can figure it out. The easiest project was buying new pillows and planters for the covered patio but don't think for a moment I didn't work on the hard projects too. I have been covered in soil, paint, caulking, and window glazing for two months! Almost ready for winter! Many thanks to all my help, David, Christian, John, Chuck, Louise, and Joe and Anthony Dossi. 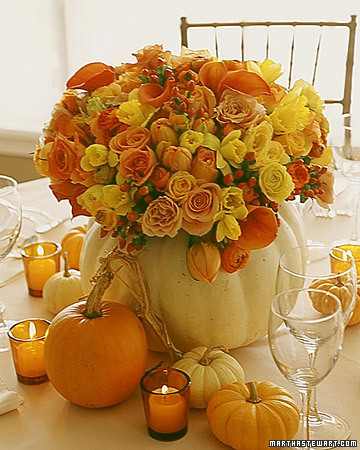 "FLORAL ARRANGEMENTS WITH FALL FOLIAGE". Plus the Most Delicious German Pancake Recipe Ever! 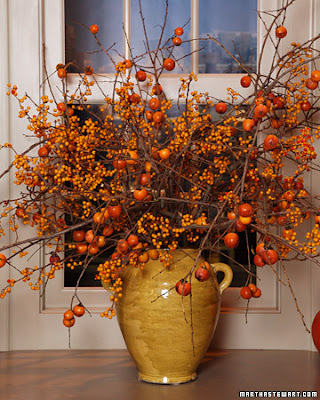 The fall garden holds more potential floral arrangements than you might initially realize. I love the burnished leaves of Nandina with it's bright red berries, the cascading shape of cottoneaster (pronouced ka-tone-ee-astor) also with red berries, and the unusual color that the leaves of peonies turn this time of year. Late sunflowers mix beautifully with fall foliage too, especially if the vessel holding the arrangement has some autumn elements. This is an old copper oil can and the spout has a hinge that extends fully for ease of pouring. I love the way these olive oil cans relate to my vintage cranberry dessert dishes and tangerine hued, pear shaped candles. I saved a dozen or so and keep them on hand for various design projects. a variety of vases and vessels ranging from metal to ceramic to clear glass. For intermediate to advanced floral designers, stems purchased at the flower market make the most beautiful home made centerpieces. Since so few florists do trendy styles like the display above, it is good to learn to do your own, particularly for the holidays. 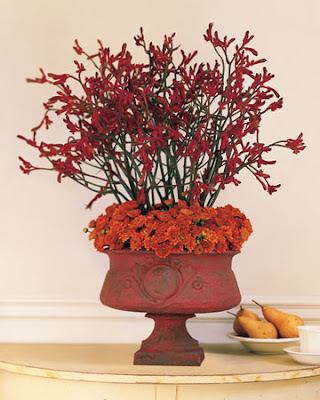 This arrangement has kangaroo paws in a bed of small but colorful mums. All remaining images from Martha Stewart. What makes a centerpiece beautiful? Mostly the composition. Whether large or small, vertical or horizontal, loose or tightly arranged, the beauty lies in how the elements relate to one another. When working with branches be sure to pulverize the woody stems so the plant can absorb water. Always remove the lower leaves so the water stays fresh, and replace the water with fresh water every other day. 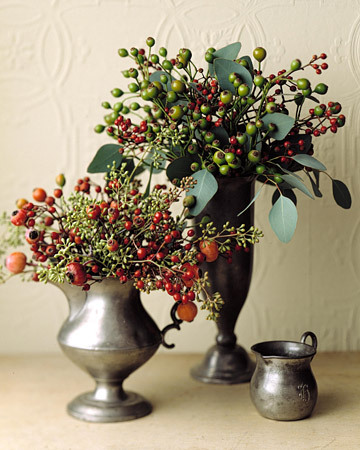 These pewter vases are gorgeous, soft and elegant filled with viburnum and eucalyptus. 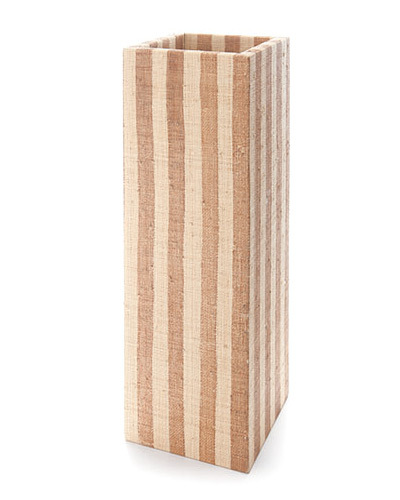 This display is formal and requires oasis, floral tape, picks and a wide mouth, "squat" vase. It has viburnum berries, magnolia leaves, a few pomegranates, tulips, and roses. 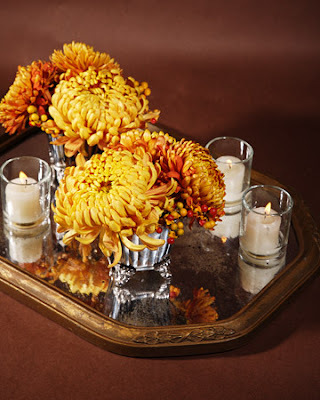 Low centerpieces are ideal for entertaining at the dinner table. 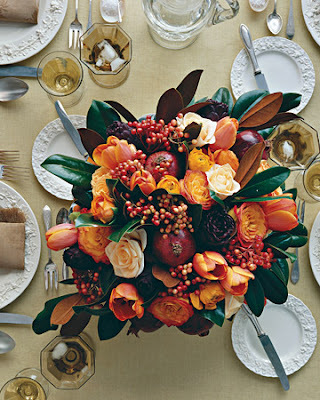 Above is the most complicated and costly centerpiece. Complicated because of the time spent carving out the pumpkin and costly because so much material is required for the full effect. It has amazing callas, daffodils, coffee berries, roses, and very little greenery. Sunday morning I made German Pancakes for my son Christian and fiance' David. My family and I have been enjoying this recipe from my sister-in-law Sharon for over 20 years but yesterday I made a slight change--I increased the size and it changed the pancake completely. Here is the altered recipe. You can feed four hungry people. Try it with real maple syrup. It is expensive but I find well priced, Grade B syrup at Trader Joe's and TJ Maxx that is delicious. Once you use the real deal you won't go back to the gloppy, overly sweet stuff that is so bad for you. Preheat oven to 350 degrees. Put butter in 9 x 11 oblong Pyrex baking dish and place in oven till melted. I like to get the butter a little brown but that's a personal choice. In a mixer bowl partially blend milk and flour. With mixer running add eggs, vanilla, and salt. Pour all ingredients into the buttered baking dish, scraping sides of bowl with a rubber spatula. Place on second shelf from top to allow the pancakes room to rise. They get quite high. Bake 25 minutes and serve with warmed maple syrup or powdered sugar. Some people add lemon juice and powdered sugar. I understand that version is called a Dutch Baby.